Both cybersecurity stocks have gotten cheaper lately, but which is the better buy now? Judging by their relative stock price performances, there's little question in investors' minds that Fortinet (NASDAQ:FTNT) has a brighter future than FireEye (NASDAQ:FEYE) in the cybersecurity market. Its shares are down 12% in the last year compared to a near-60% dive for FireEye. The drop could spell opportunity for investors looking to gain access to this growing industry at a discount to Fortinet's expensive price-to-earnings valuation. But is a FireEye purchase really worth the extra risk? Billings growth is for calendar Q2. Gross margin, net margin, and valuation ratios are for trailing 12 months. Data source: Company financial filings and YCharts. There's no question that FireEye is facing major challenges that impact its operations, its finances, and its management. Billings growth has slowed for several consecutive quarters and has missed executives' forecast by a wide margin recently. FireEye isn't profitable -- and doesn't expect to reach that milestone for at least another year -- while Fortinet has remained barely, but consistently, in the black. Meanwhile, FireEye is going through a major shake-up in its management suite, which adds another layer of uncertainty for investors. On the other hand, the company has made huge strides at lowering its costs. Operating margin improved to a negative 28% last quarter from a 41% loss the prior year. New CEO Kevin Mandia told investors that the company sees plenty of room for further improvement that should allow the IT security specialist to reach non-GAAP profitability by the end of 2017. The stock's valuation, meanwhile, reflects pessimism on the part of investors: At 3.5 times last year's sales, FireEye is as cheap as it has ever been. Fortinet's end-to-end security platform, in contrast, appears to be finding more success at winning a place in IT budgets around the world. Billings rose by 26% last quarter and deferred revenue spiked higher by 37%. The company's profit margin isn't impressive at barely 1% of sales over the past six months. However, Fortinet managed to operate in the black while significantly boosting its research and development spending. R&D investments are up 45% so far this year, which ideally will help the company protect and extend its market share lead over the coming quarters. Rising gross profits are also powering higher spending on sales and marketing, just as investors would hope to see in a company that's fully in growth mode right now. 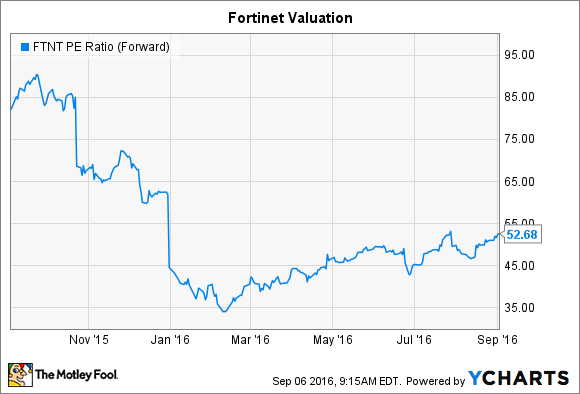 As for valuation, Fortinet is far pricier than its smaller peer when judged on sales. Investors have to shell out nearly 6 times the past year's revenue for this company, compared to less than 4 times for FireEye. We can't compare the stocks on an earnings basis, as FireEye hasn't yet produced any profit. However, Fortinet's P/E of 53 puts it roughly in the middle of its historical range. Investors paid nearly twice that premium a year ago, but also were willing to let shares go for just 35 times earnings in late February. FTNT PE Ratio (Forward) data by YCharts. Still, I'd pick Fortinet over FireEye, hands down, mainly because it is snatching market share right now, even if sales growth has slowed recently. Those gains are critical at this point because they allow for extra spending on improving its security platform and on building up its sales network. In contrast, FireEye is in a more defensive posture and, while that's reflected in its lower valuation, I wouldn't start a position in the stock until it was clear that management has a solid turnaround strategy in place that doesn't just involve cost cuts.